FICO Blog / Risk & Compliance / US Credit Quality Continues To Climb – But Will It Level Off? Risk & Compliance US Credit Quality Continues To Climb – But Will It Level Off? According to the latest national distribution of FICO® Scores, US consumer credit quality has continued the slow-and-steady climb we’ve seen over the last few years. As we’ve observed for several years now, more consumers are scoring 800 or above—19.9% vs. 19.6% just six months earlier. And fewer consumers are scoring below 550. In fact, there’s been a clear pattern of decline in this segment since the low point of the economy in late 2009/early 2010. Some of this trend may be a result of the lowest-scoring consumers “dropping out” from traditional credit usage, and by extension no longer having valid FICO® Scores. Still, this decline is encouraging. It indicates that overall more consumers using credit are managing it responsibly enough to not be among the lowest scorers. In addition, the national average FICO® Score is currently at an all-time high since we’ve been tracking this metric, dating back to pre-recessionary 2005. That said, the improvement in this average seems to be slowing, stabilizing around 695 after a steady climb between October 2013 and October 2014. We also looked at trends in consumer repayment and delinquency. There’s been a continued decrease in recent serious delinquencies (defined as 90+ days past due) across all credit products—from 19.4% in October 2013 to 18.2% in the most recent April 2015 timeframe. This is clearly a key driver behind the improvement we’ve observed in the score distribution over that period. Note, however, that when we break down these delinquency trends by credit product, the decrease appears to be almost wholly driven by the real estate segment. This suggests that we are getting further and further from the worst of the housing downturn. By contrast, the auto and bankcard industries show relatively little, if any, drop in delinquency over the past few years. An interesting finding emerges when we shift to a shorter-term view of delinquency trends—that is, delinquency in last 12 months as opposed to last 24 months. In this case, we see that the April 2015 figures are actually creeping up slightly relative to the October 2014 stats. In summary, the national FICO® Score distribution continues to improve, although we are starting to see evidence—both in average score as well as delinquency measures—of a “leveling off” in credit quality. We will, of course, closely monitor this trend to assess: Does it represent a brief pause in the continued US financial recovery? Or indicate that cracks are starting to show at the edges of what has been for several years now a relatively low-risk underwriting environment? 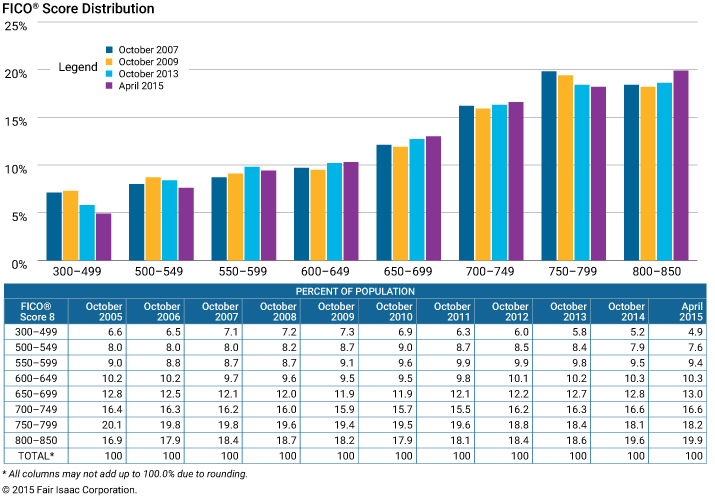 Editorial note: check out our more recent blog entry on the national distribution of FICO® Scores and US consumer credit quality: US Credit Quality Rising … The Beat Goes On. Hello. I have been doing a lot of exploration on the internet and cannot find any information on how to improve on an already excellent FICO score. Mine is a 797 at the present time using TransUnion. What steps are required to move up higher into the 800’s. Thanks for your question. Since this is our B2B blog, we recommend that you check out the myfico.com consumer forums at http://ficoforums.myfico.com/ for questions about your individual FICO Score. It’s a great place to post questions like yours and to get credit scoring advice. How does FICO consider ‘new accounts’. My credit report says I have 9 new credit accounts, however, they have been open for over a year… what constitutes a New Account? Opened within 6 months, a year, two years? Hi again Virginia: Thanks for your interest in our blog. As we indicated in an earlier response to your comment in another post, your best bet is to check out the myfico.com consumer forums at http://ficoforums.myfico.com/ for questions about your individual FICO Score and circumstances. It’s a great place to post questions and get credit scoring advice. I traded in my care for a new one. The dealership ran three hard inquiries on my credit report. Can I have two of them removed? I’m curious, does the April-15 number represent the data only from October 14 through April 15 (a 6 month average? ), or is the April-15 data a 12 month rollup? Does Fair Issac release information on the standard deviation of FICO scores across consumers? That’s not something we often get asked for! Generally speaking, the standard deviation of the FICO score on a representative national sample is around 100. Its great to see credit quality improving, what effect, if any, do you attribute to education and the availability of ‘free’ scores via Discovery and Citibank? Shouldn’t we expect that the FICO score stratifies the population such that we must have a reasonably consistent percentage in a given band. In your example, you show a decline in the 750-799 range and improvement in the 800-850 range suggesting that some consumers improved just enough to “move up”. That said, the differences are small so we’re still hovering in the 19-20% range for both the 750-799 and 800-850 ranges in the roughly 7 year span of your graphic. To what extent does the economy play into the changes? Unemployment is now down to a more reasonable level, but in 2008-2010 it was much higher. Doesn’t this cause people to behave differently? If a worker living paycheck-to-paycheck loses his job, he will be late on credit payments because he has no option. With lower unemployment, the worker with little or no savings can hopefully keep up with payments because he’s at least employed. Lots of good questions here! Taking them one at a time: you are definitely not the first person to comment on how stable the FICO score distribution is over time. In fact, during the worst of the great recession, we had clients expressing concern that the national FICO distribution wasn’t shifting more noticeably downward—but the fact is that even during the worst point in the mortgage crisis, some 9 out of every 10 borrowers were still paying their mortgage as agreed. So the overwhelming majority of consumers were still successfully managing their credit obligations, even during the worst of the downturn, and as a result, the shift in FICO distribution on the aggregate was relatively muted. While it is difficult to quantify the precise effect that the Open Access program is having on overall nation-wide credit quality, the number of consumers with free access to their FICO Score via Open Access continues to grow beyond the 100 million account milestone reached late last year. And that degree of credit education and empowerment can only help consumers better understand what credit behaviors can drive an improved FICO score, and encourage consumers to take those steps. As far as the impact of macroeconomic factors on FICO score distribution, we definitely see a relationship between the two. On the aggregate (national) population, the impact to score distribution of economic effects is generally quite modest, for reasons similar to what I mention above about the relatively small percentage of the population that is being affected. But you can definitely observe in the data above that the trend in score distribution/avg score tracks the overall health of the US economy. I would note that the FICO score is a lagging not leading economic indicator—meaning that a consumer’s FICO score is only going to change as a result of a material change in their credit report (perhaps a ramping up of credit usage and/or falling behind on payments). And in the context of a deteriorating economy, that sort of material change is only likely to occur after all of the following: consumer loses their job, exhausts any savings safety net they may have, begins ramping up their credit usage and/or is unable to make minimum payments on debts and begins falling behind. 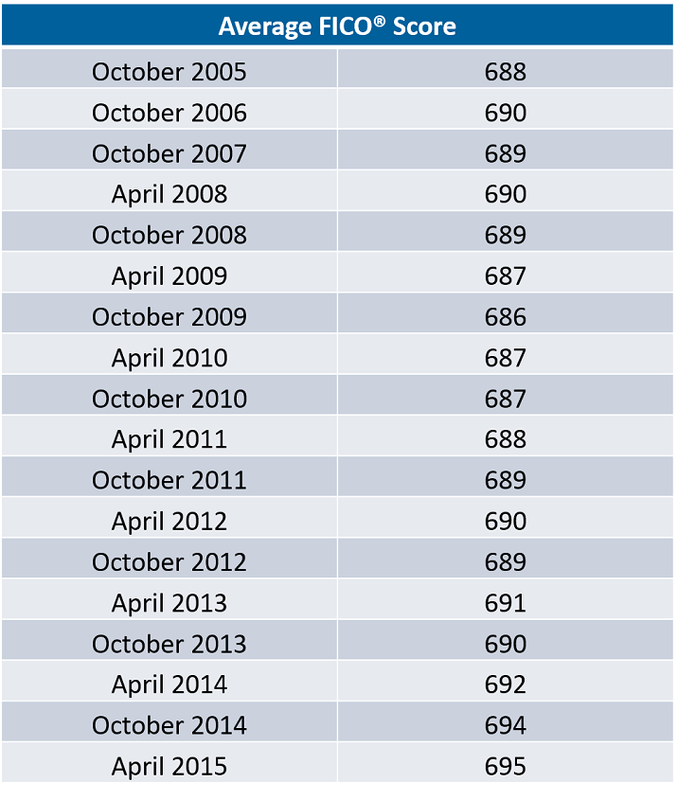 That explains why the pre-recession peak avg FICO score of 690 occurred as late as April 2008, even though the great recession was already underway at that point. Hi, I have a question about the definition of the population you use. Is that the total US population? or the population who have the FICO Score? Thank you. The analyses cited in this blog were based on a representative national sample of consumer credit files which meet the FICO minimum scoring criteria. Yes, thank you. I noticed that updated blog earlier this week. I couldn’t help but take a look at other discussions you had on Disqus and one that I found particularly interesting was the one you had with ‘Jax’ about 9 months ago. You two discussed about credit scoring and how someone in a higher fico bucket would be “penalized more” than someone in a not as high fico bucket. Your response was that fico scoring will adjust when new positive information is recorded regarding the consumer’s credit history. What’s your opinion on trending data? Trending data seems to become quite popular in marketplace lending. Is trending data currently being used in FICO scoring? Will it be used? What are the pros/cons about using trending data for credit scoring? Thanks for reading, and stay tuned to the FICO blog! I would very much like to see these numbers showing older scoring models of FICO. How do the Beacon, Empirica, and FICO Classic charts look in comparison? Just curious to see the effects of time and recession on the more common mortgage scores. Thanks for the interest! For the purposes of simplicity in presentation, we focus the data in these blog entries on the FICO Score 8 model. That said, I can confirm that we observe very similar score dynamics over time when looking at other FICO score versions such as the ones you allude to. By way of example, for FICO Score 5 at Equifax (aka Beacon 5.0), we observe a 10 point increase in average score between our 2009 and 2015 data, similar to the 9 point increase shown in the table above. As in FICO version 9. Can FICO 8 generates a score based on “one” trade line (revolving a/c) that’s six months old and has been used at least once in the last 6 months? The two key FICO Score minimum scoring criteria that must be satisfied in order for a valid FICO score to be returned are that there must be at least one trade on the credit file that has been open for at least 6 months, and 1 trade that has been updated (e.g. reported by the lender to the credit bureau) in the past 6 months. These two key criteria are the same for FICO 9 and FICO 8, as well as for prior versions of the FICO score. As long as those two criteria are satisfied—and they can be satisfied by the same trade line as in your example above—then the file should be scorable by all versions of the FICO score. What percentage of adult American’s (18+ yrs old) meet the minimum scoring requirements for a FICO score?